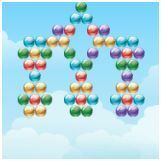 Bubble shooter level pack includes the best features of a bubble shooter game, as well as challenging levels. One must complete a level in the allowed time. The sooner you complete the level, the higher you will get a score. This is an ad free game. Use the mouse to set the angle and shoot the Bubble towards same color bubbles. fire - left mouse; movement - mouse.